Hekate is a complex goddess with many faces Oftentimes, neo-Pagans pigeon-hole her as a crone goddess of wisdom. While she can be understood that way, she is so much more to me. 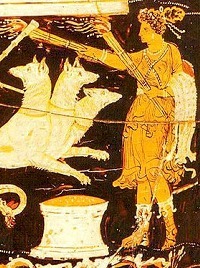 Through research into her traditional areas of jurisdiction as well as personal gnosis gained through experience and communication with the goddess today, I have come to understand Hekate as a goddess with three broad, major domains of influence – liminality, transitions, and transformation – and a vast many related “minor” domains. In my personal practice, I associate her with liminality because of her ancient post as a goddess of doorways/gateways. Her altars were sometimes kept at the entrance to the temples of other prominent Greek deities1. The people of Greece also kept personal altars to the goddess at their front door1. Posted in/at/as the doorway, Hekate occupied a unique space, a liminal space, the space between, the space that is neither this nor that, here nor there. For this reason, to my mind, when we are betwixt and between, when we are nowhere at no time for reasons that are unclear to us, we are in her realm. These liminal spaces can be a source of grace where we can gather our thoughts and feelings with the focused illumination provided by Hekate Phosphoros (the Light Bearer)1 and then strike out boldly in some productive direction of our own choosing with Hekate serving as Propolos (the attendant who leads)1. However, liminal spaces can also become bastions of fear, doubt, and confusion, painful places that look more like prisons than havens. In either case, they are not places where one should linger indefinitely. Hekate is a patroness of such places in their light and in their dark aspects. The beauty and terror of these places is also the beauty and terror of Hekate. Here, she is prominently Hekate Atalos (the Tender)2 as well as Thea Deinos (Dread Goddess)2 and Hekate Brimo (the Terrible)2. In ancient Greece, the crossroads – a liminal space because it is where roads meet (i.e., it is none of the roads yet it’s part and parcel of each) – were the jurisdiction of Hekate Trioditis (of the Crossroads)2. I believe that they are still under her influence. Crossroads were understood as particularly dangerous places where all manner of seemingly vial and nefarious beings took up residence2. These beings were usually the spirits of the restless dead led on their nightly revels by Hekate herself in her Nyktipolos (Night Wandering) aspect2. Because Hekate leads and rules these beings, she was often invoked in Greece as Hekate Apotropaios (Averter of Evil) for protection against these nightly terrors1. It is common for deities to have the power to bring on or hold at bay those forces under their sway. Ghosts and other restless dead were and are no exception. Hekate can prompt them to induce terror or calm their wrath3. Hekate’s second most prominent domain is transitions; she is nothing if not a goddess of the core processes of life, death, and rebirth. This is not surprising for a goddess of doorways/gateways; she is, after all, Hekate Propylaia, the one before the gate1. As Hekate Kleidouchos, she is Keeper of the Keys, the keys that lock and unlock that gate. Through the metaphor of unlocking a gate, Hekate facilitates movement, the transition from the liminal space into a more definite space, whether it be the from the doorway to the inside of a temple or from a state of indecisiveness to decision or from a state of confusion and fear to understanding and confidence. She bears the torches that light the way to the gate and she keeps the keys that unlock the gate allowing each seeker passage through. We also see Hekate as a goddess of transitions in her role as Kourotrophos, the nurse of the young. She governs the developmental stage from marriage to childbirth and, similarly, the final stages of life where a person passes out of the world of the living and into the world of shades3. As Hekate Chthonia (of the Underworld), she greets souls at the gates of the underworld, unlocks them, and ushers souls through to the other side2. She is also a companion to Persephone, Queen of the Dead, and she accompanies her yearly as she descends into and on ascends out of her underworld abode2. This is one of the most powerful and prominent transitions in Greek myth. Hekate’s influence over transformation is a necessary outgrowth of her role as a goddess of liminality and transitions. As we move from step1 to 2 to 3 and so on, we change. Each transition teaches us its mystery and provoke us to change in dynamic relation to all of the steps that have gone before. Productive transition is by definition a type of transformation. I also associate Hekate with transformation because of her ability to help us ascend out of and descend into our psyche. She can help us delve into our underworld (the unconscious), drag what’s concealed there past the gate (into the subconscious, because she’s not afraid to get her hands dirty), and then hold a glaring light to it (conscious awareness). With the light cast upon it, we can assess it, process it, and then use it in a productive and healthy way toward our becoming. It is as Perseis (the Destroyer)2 that she aids us in destroying thought and behavior patterns, relationships, and anything else that no longer serves us. It is as Hekate Soteira (the Saving Goddess)4 that she helps us to create new patterns and relationships that heal us and advance us on our spiritual soul journey. It is also in this capacity that she can link us to other deities, other beings, and other worlds4 . In conclusion, Hekate is an awesome lady and I have been blessed to have her as a patroness. As a goddess of liminality, transitions, and transformation, she presides over and occupies “the space between”. I am not the first to speak of these three overarching domains in relation to Hekate; however, these critical aspects of her being are so profound that they bear repeating and they are made all the more powerful when put into direct relationship with her myriad divine roles from antiquity. Our lives and, I would add, our planet and our universe are in a constant state of transition. The various processes that move our lives along are in continuous motion. Birth, growth, death, and rebirth. Begin, develop, end, and begin again. Due to her connection to these transitions, we are always oscillating between the points in a given cycle, hence the liminality and also the transformation (as we inch forward in the cycle). Hekate, in her glory, rules all of this. Any undertaking that requires a link between two or more states, stages, or steps requires her might. In my opinion, Hekate’s reach is truly limitless. In all honesty, I see her might and main even in the shaping of galaxies and other cosmic phenomena. Hekate’s praise names/epithets and their most basic significance were drawn from the following four books and websites. However I have read many materials about Hekate. For additional information on the sources below or for more information on other material that I have read, feel free to contact me. * I apologize; the superscripts do not translate from MSWord very well.